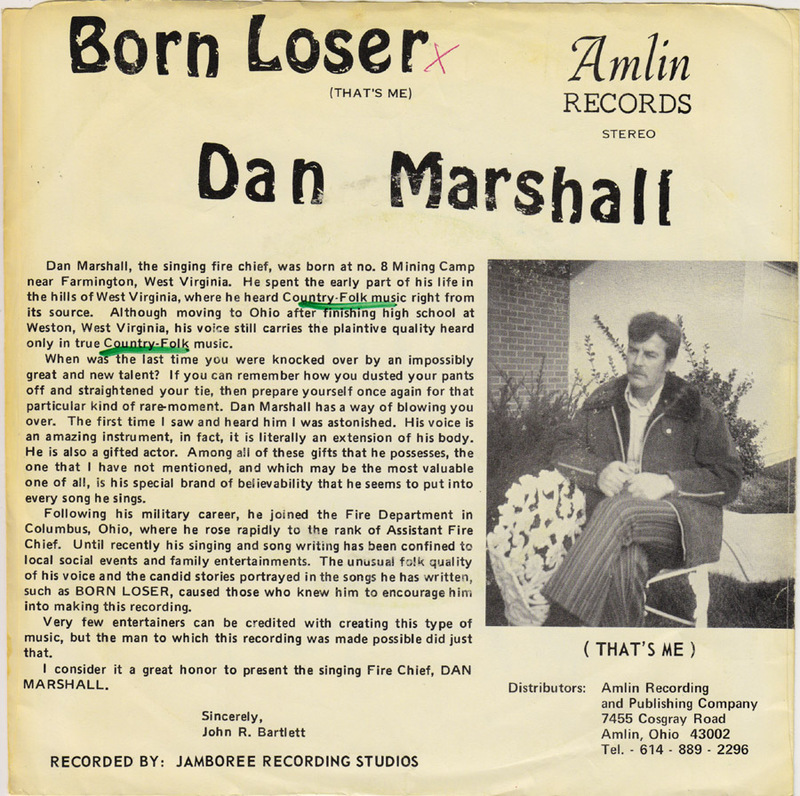 Dan Marshall, the singing fire chief, was born at no. 8 Mining Camp near Farmington, West Virginia. He spent the early part of his life in the hills of West Virginia, where he heard Country-Folk music right from its source. Although moving to Ohio after finishing high school at Weston, West Virginia, his voice still caries the plaintive quality heard only in true Country-Folk music. When was the last time you were knocked over by an impossibly great and new talent? If you can remember how you dusted your pants off and straightened your tie, then prepare yourself once again for that particular rare moment. Dan Marshall has a way of blowing you over. The first time I saw and heard him I was astonished. His voice is an amazing instrument, in fact, his voice is literally an extension of his body. He is also a gifted actor. Among all of these gifts that he possesses, the one that I have not mentioned, and which may be the most valuable one of all, is his special brand of believability that he seems to put into every song he sings. Following his military career, he joined the fire department in Columbus, Ohio., where he rose rapidly to the rank of Assistant Fire Chief. Until recently his singing and song writing has been confined to local social events and family entertainment. 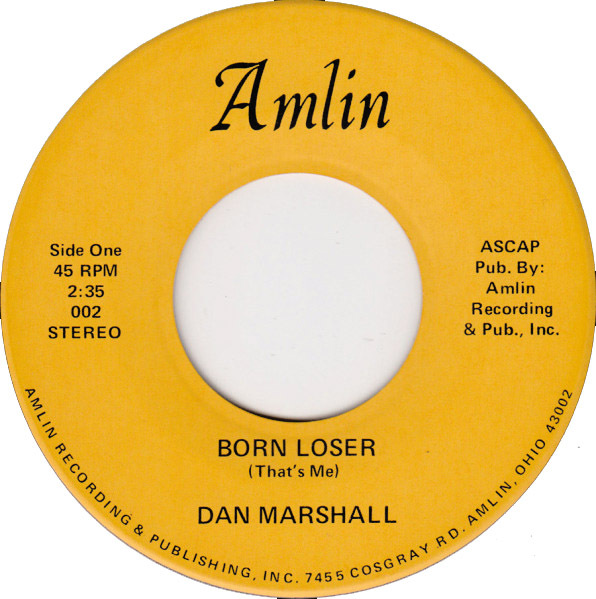 The unusual folk quality of his voice and the candid stories portrayed in the songs he has written, such as BORN LOSER, caused those who knew him to encourage him into making this recording. Very few entertainers can be credited with creating this type of music, but the man to which this recording was made possible. did just that. I consider it a great honor to present the singing Fire Chief, DAN MARSHALL. 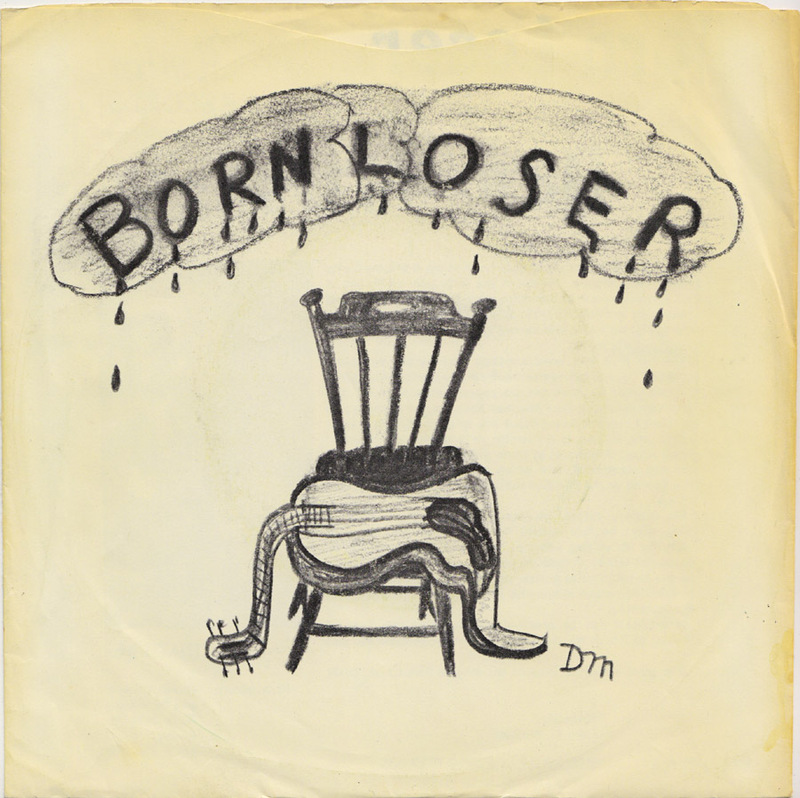 Two years ago I posted a privately pressed record by Dan Marshall that I had found in a Berlin charity shop. Now last week Dan Marshall´s son Dan found that post and sent me an email, requesting the two MP3s that I had deleted in September. I was happy that he contacted me and sent him the files and he kindly sent me a song of his in return. Dan is a musician himself, living in Portland. He then also posted his father´s songs on his own blog. I suggest you to go there first and read his story. In September I deleted the links to couple of hundred MP3s because I didn´t want to have a permanent download archive any longer. Now I think, maybe I should have kept some of the links to the more obscure private recordings. Anyway I´m happy to put these two songs by Dan Marshall, the singing Fire Chief, up again, plus a very sweet rendition of Lesson From A Rose recorded by his sons in the summer of 2001. They really enhance the beauty of the melody of their fathers song. All of these songs sure deserve to be heard. Andreas, thanks so much for posting this! Again, it was a real joy to find that my dad’s music made it halfway around the world, along with the kind words you had for his songs. I hope that people are writing blog posts about randomly stumbling upon my music 40+ years from now! I also appreciate you sending me the mp3s… a real blast from the past. it was my pleasure. Thanks for allowing me to post your father´s songs and your own. If you ever consider visiting Berlin you´re welcome to be our guest.